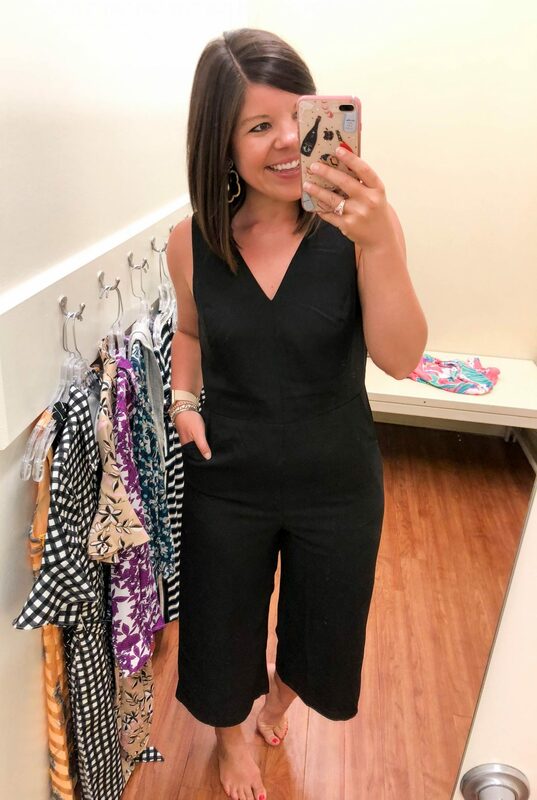 BUT, never fear if you’re not local, you can shop Banana Republic Factory’s great styles online and still take advantage of all their great discounts! 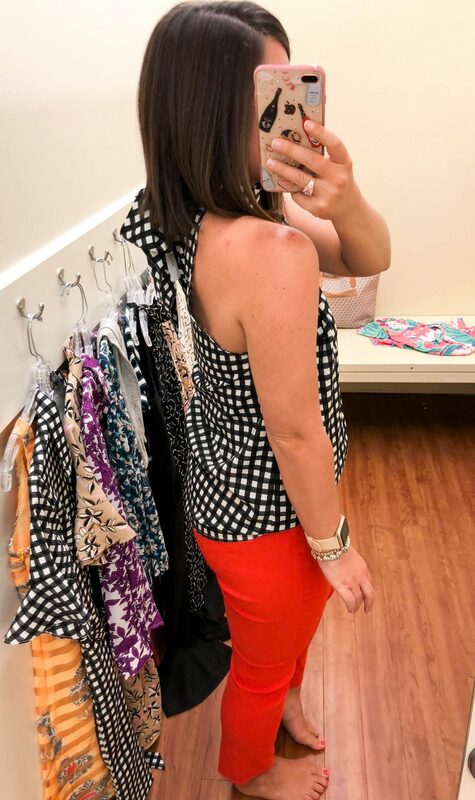 Banana Republic Factory is truly my go-to store for timeless style that still packs a punch! 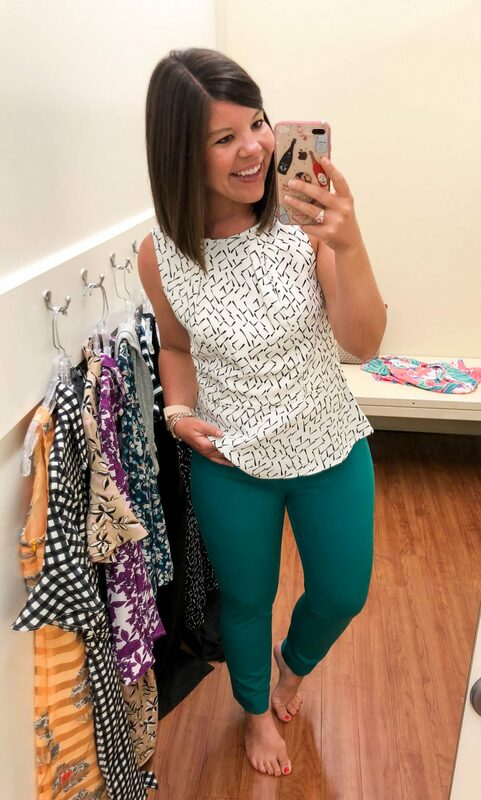 I swear by their Sloan pants for the office (you’ll see a pair below) as well as their blouses that are perfect for layering and their well-fitted dresses. So let’s have some fun and I’ll show you the great pieces I found! 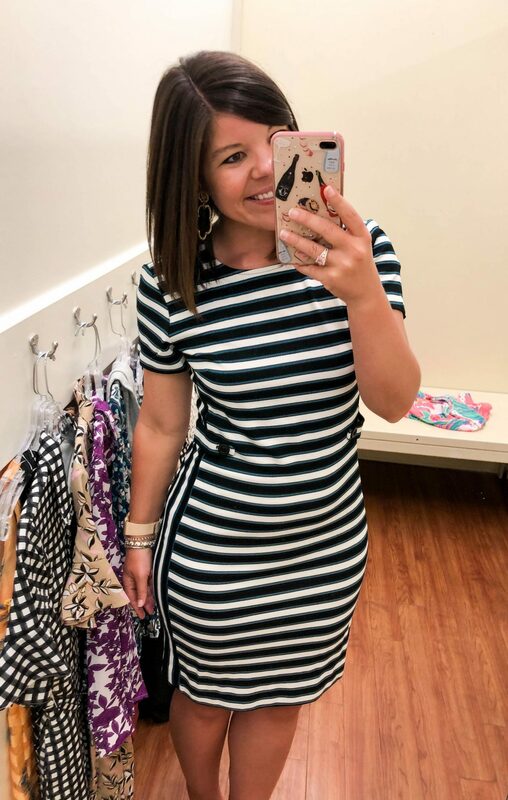 Striped Dress (wearing size 6) – Such a great fit and a really stretchy fabric that would allow you to really be comfortable at the office all day. 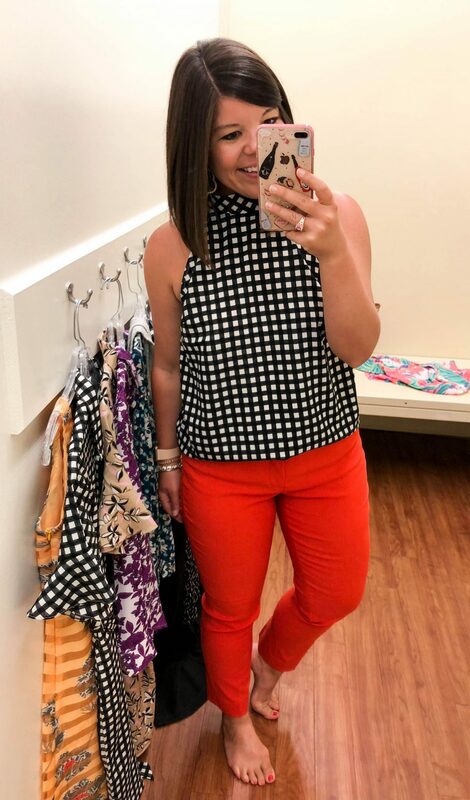 Orange Sloan Pants (wearing size 6) || Gingham Tie Neck Top (wearing size small) – This who outfit makes me feel so “chic!” I’m loving the sweet bow on the tank too! 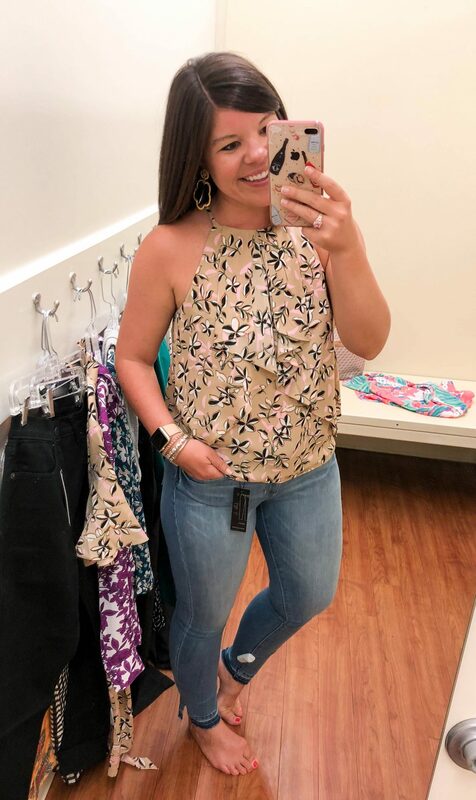 Floral Ruffle Neck Top || Medium Wash Jeans – I love pairing something more formal with a casual piece (like the jeans). It is a fun juxtaposition! 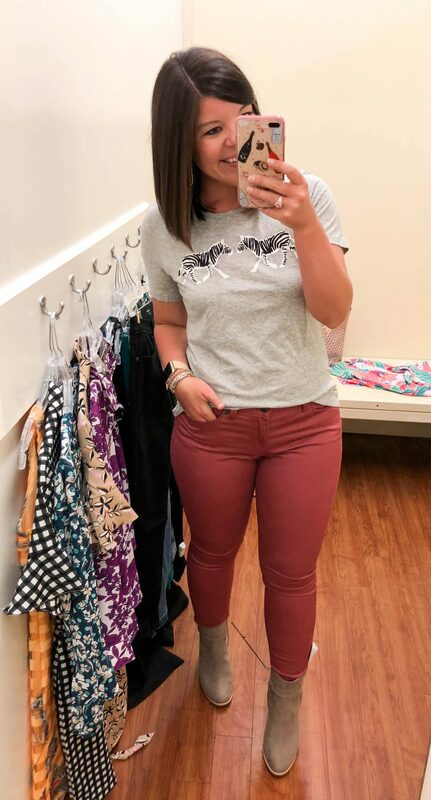 Zebra Tee (not online yet) || Pink Sateen Denim (wearing size 28/6) || Gray Booties – Is It fall yet? This outfit has me in the mood to transition seasons! 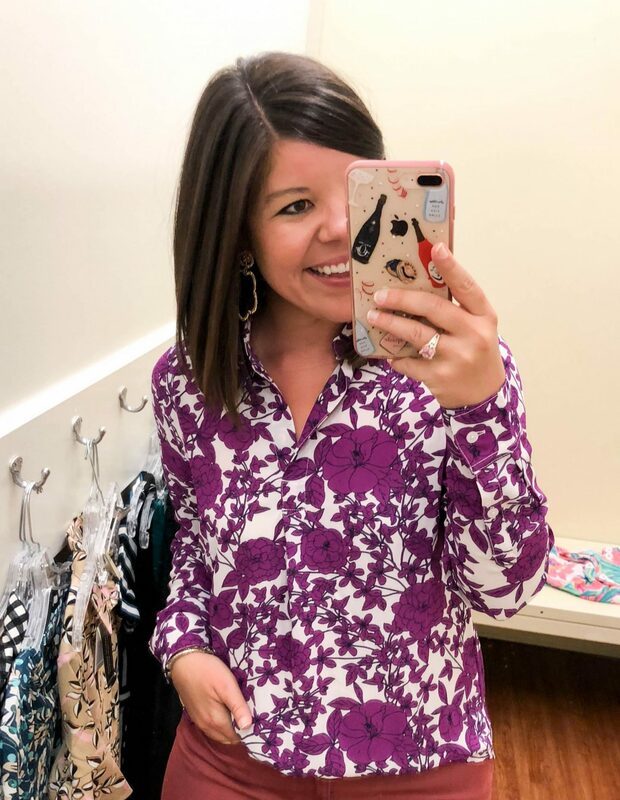 Purple Boyfriend Top – These kind of tops are my wardrobe “workhorse” because I reach for them all the time! 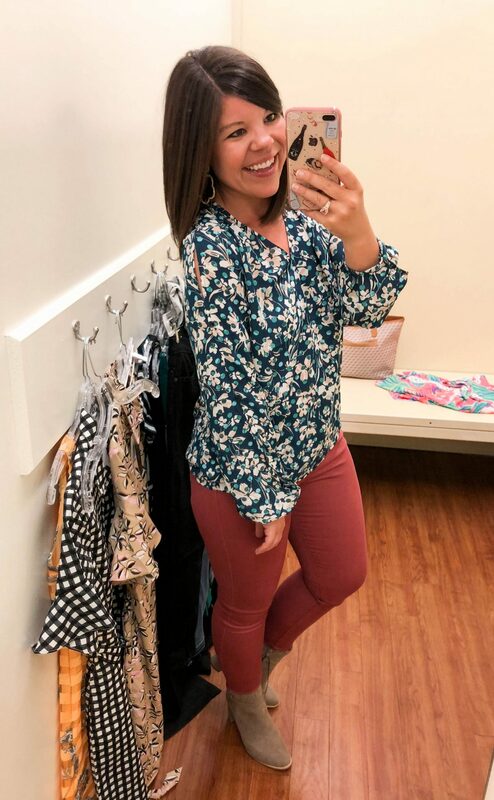 Floral Cold Shoulder Top || Pink Sateen Denim (wearing size 28/6) || Gray Booties – Ok, now this is FALL! Grab your PSL and bundle in friends! 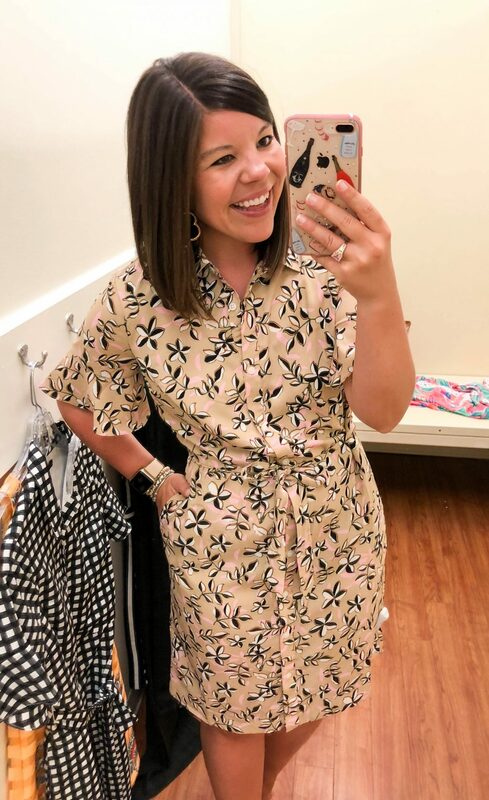 Floral Ruffle Sleeve Dress – You can tell I loved this print so much! 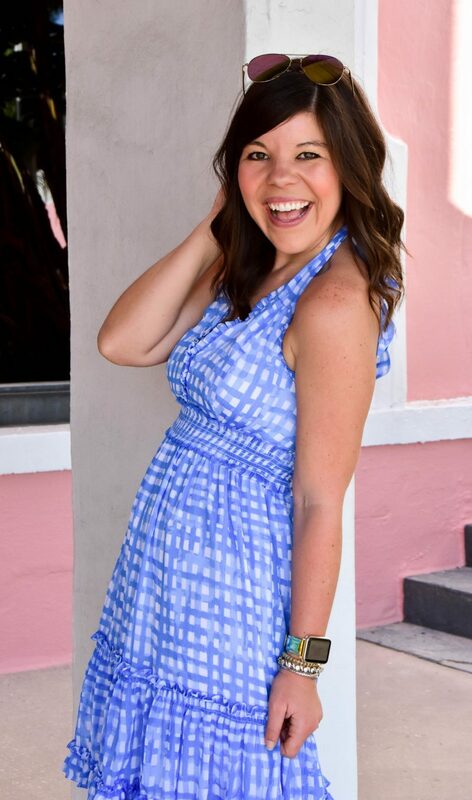 This dress is perfect for work and will add a little “punch” to your workweek! 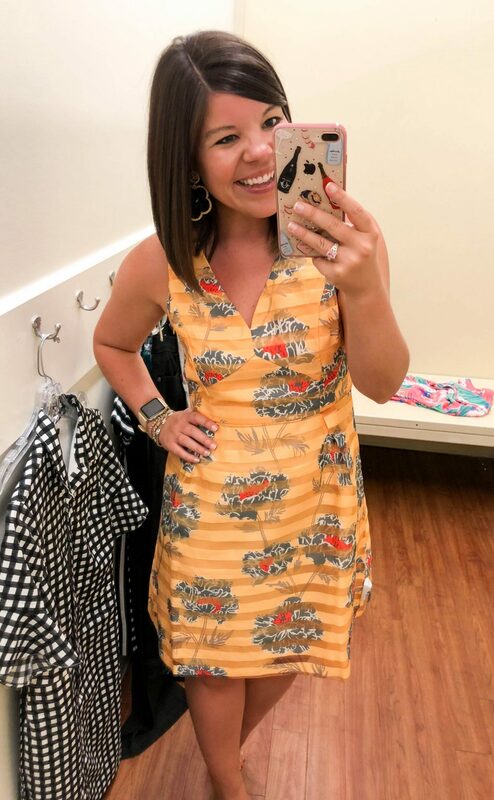 Yellow Striped Dress – If you come to the event you just may see me in this look 🙂 I can’t say enough ways that this dress is a winner! 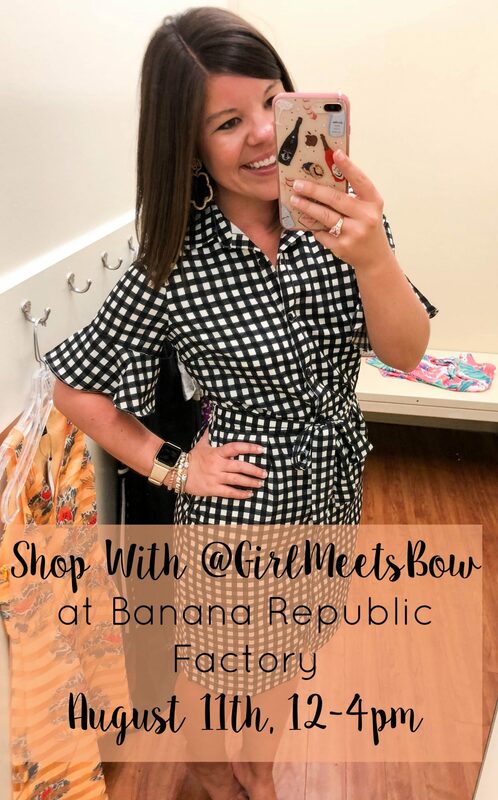 Thank you so much to Banana Republic Factory for partnering with me on this post and event! Thankful to work with brands I believe in and trust! How fun would this be! I love shopping at the BR factory, these are some great picks! That last gingham dress is gorgeous! It is such a great place to shop! I always find pieces I love! 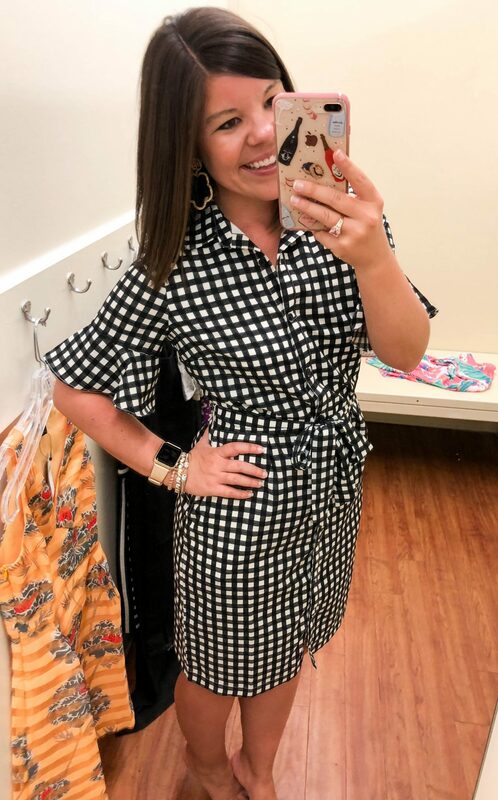 What size are you wearing in the gingham dress Gentry? I LOVE it! Wow all of these looks are really cute! Especially love the striped dress. Pretty outfits dear, especially the Black Wide-Leg Cropped Jumpsuit. Simple, yet so chic and elegant. The Yellow Striped Dress looks so fun too!